Patchworker and crafter who wants to provide a lovely space, that is welcoming and practical to sew with friends. Hi, things have been hectic as always, busy with work, the retreat and life in general. I find in the winter months I sit by the fire rather than venture into the sewing room so not much happening really, other than to much chocolate is being consumed. At the retreat all the lovely ladies that visit have been all doing a joint postage stamp quilt inspired by Red Pepper Quilts. So I thought it would be a lovely thing for ladies on retreat that have a few scraps left over, to throw into the old suitcase and spread the love. After all the collecting and patching I thought we could donate the finished quilt to an organisation. I have found this great charity called Assista Sista. This group helps women who have come out of domestic violent situations, to set up house- haven and start again. They fit out the home with all donated goods, new and pre loved. www.assistasista.com.au if you would like to help. They are based on the Gold Coast but have over 28 havens now with the wonderful help of others. If you would like to help of just follow on Facebook please check them out. And I best get on with making little bits of fabric into bigger bits. Oh we are quite mad! Love to you all and get sewing to help a Sista. If you would like to help Circle Retreat and either make some blocks or send fabric scraps let me know. 2″ wide x 7″strips required. 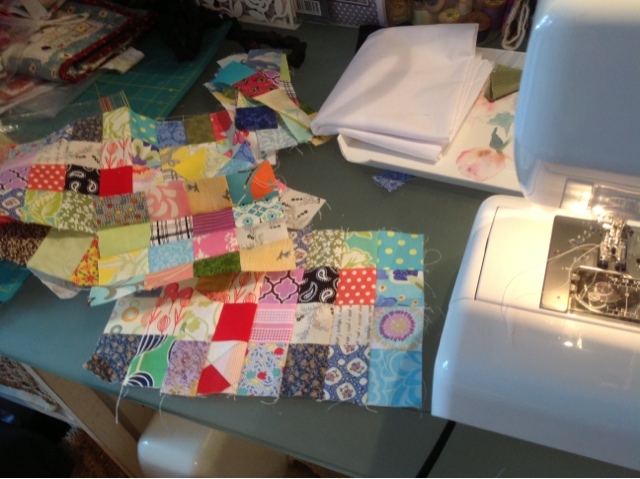 Sew 4 strips together. 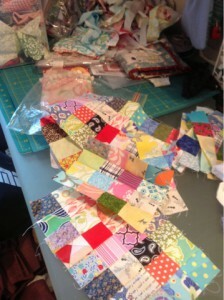 then cut lengthways strip 1 3/4 ” then mix n match baby to sew a little block of 4 together.